Join us on a tour to the incredible Grand Canyon West Rim. The site is owned by the Hualapai Indian tribe and they operate the transportation to the Grand Canyon West Rim spectacular scenery. This is an enjoyable ride through beautiful desert landscape to the Indian reservation and there you will enjoy three stops that include breathtaking views of one of nature's most fantastic wonders. This is the home of the world famous Skywalk, an incredible 4000 ft. above the canyon floor. Try it if you dare! The tour will start at your hotel lobby at 8:00 am and we will travel to Hoover dam for a photo stop. We will continue on through the beautiful Mojave Desert landscape for approximately 2 hours to the Grand Canyon West Rim. On the way we will travel through an ancient Joshua Tree forest, a form of yucca cactus that only grows in the Mojave. The Hualapai Indians operate the West Rim property and there you will have many photo opportunities with your hosts and during the rides to the major stops they provide! Enjoy a traditional dance and check out the Native American wares. You can purchase a meal option that will give you a choice of Hualapai Buffet or a burger stop, or rim side BBQ! 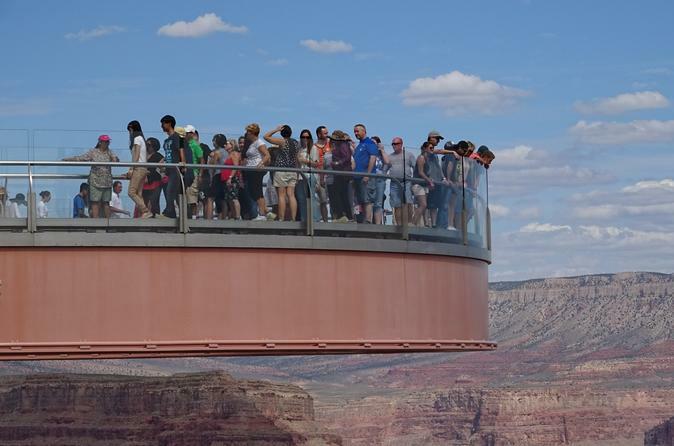 Inside the Skywalk visitor center you can learn about the history and geology of the Grand Canyon and then step out onto the visually stunning glass bridge over the incredible Grand Canyon. After about 4 hours at the canyon we will return to Las Vegas. A later departure time is fine.